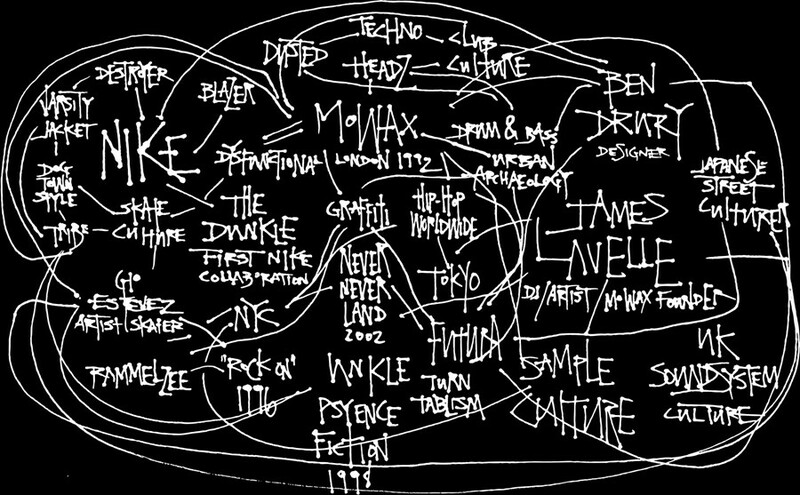 Over the course of eight prolific years, James Lavelle’s Mo’Wax label released over 200 records and countless art, film and fashion collaborations. Founded in 1992, Mo’Wax defined an era where the street cultures of London, New York, Tokyo and Los Angeles collided. The precocious spirit of the 19-year-old would go on to create UNKLE, discover DJ Shadow and collaborate with Alexander McQueen – to name a few renowned culture clashes. In 2004, Nike and Lavelle initially came together for the limited edition DUNKLE and a decade later, a new Nike capsule collection celebrates the past and future of Mo’Wax. With “Build and Destroy” its modus operandi, Lavelle revises classic Nike silhouettes for a MA1 Destroyer Jacket and Blazer sneaker. Taking collage cues from the DJ sample culture that enveloped Mo’Wax, the military aesthetic of a flight jacket meets the collegiate sportswear of a varsity, featuring slogans designed by long time friend and artist Gio Estevez, one of the original members of the Supreme skate team. What was the first piece of clothing you obsessed over? James Lavelle: I was into hip hop so the first thing I can remember ever wanting was a DMC baseball jacket. That was the ultimate. In the 80s I used to come to London from Oxford and my fashion discoveries then were the beginnings of Stussy, the Soul II Soul shop and their Funki Dread t-shirts. When did you visit Tokyo for the first time? James Lavelle: I was 18 and I met with Major Force and Hiroshi Fujiwara. I was obsessed with the attention to detail of Japanese streetwear and the era of Hysteric Glamour and 40% (which became Neighborhood). Everything was boutique. Also, back then if you walked around Shibuya the only Western people you’d see were bankers, lawyers or Public Enemy. It was bizarre. What was your approach to revisiting Mo’Wax for the new collection with Nike? James Lavelle: I started by asking myself, “How can I bring something personal to the project?” The capsule collection is about moving Mo’Wax forward and giving it context for now. I felt that it wasn’t about taking the existing images, logos and old school graphics and putting that to people. I like slogans and wording that is relevant to Mo’Wax, “Our past is your future”, “Headz”. And like sample culture, putting together different fabrics and processes. And how about your inspiration from Japanese streetwear? James Lavelle: It’s the details. Camouflage is the repeating emblem and has been through the label and everything else I’ve done for the past 15 years. 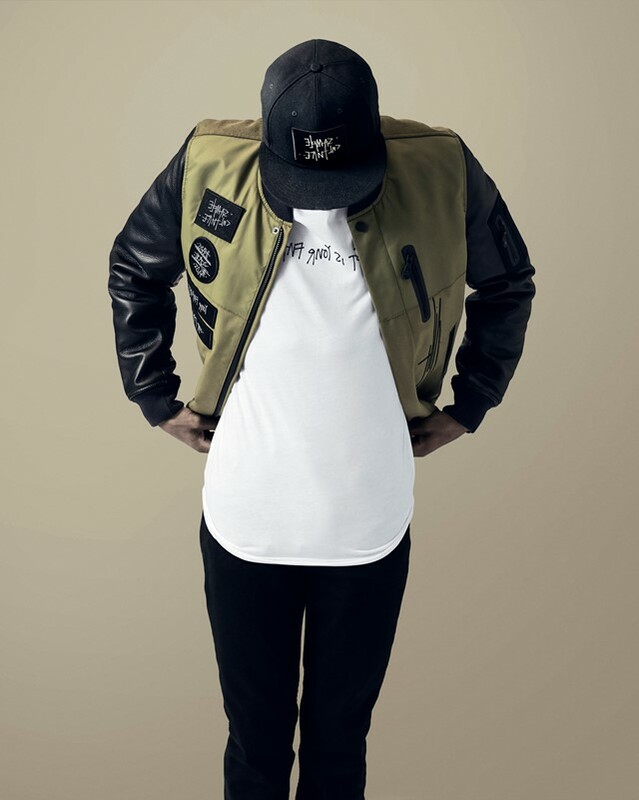 It features subtlety on the inside of the varsity – which is my favourite jacket – and is embossed on the sneakers. I wanted something that I would wear which isn’t big, loud graphics. You collaborated with Gio Estevez on the collection, what's your history together? James Lavelle: I met Gio when I was 22, after seeing his paintings in Supreme and we instantly became best mates. At Mo’Wax he created the text for the UNKLE “Berry Meditation” single, a couple of Christmas cards, and a toy that never came out. His writing style is amazing and brings that illustrative angle. There’s a history there and yet he’s also a contemporary of mine now. How does it make you feel to look back at the Mo’Wax era? James Lavelle: For the past 10 years Mo’Wax has been a poisoned chalice. Now I feel proud, “Build and Destroy” is about new times. I needed to look at myself in a different way and maybe take some comfort in the history of what one has done, and potentially that one is still capable of doing interesting things. Nike x Mo’Wax by James Lavelle drops on the 26th of November at 1948 London and other NikeLab destinations worldwide and on nike.com/nikelab.